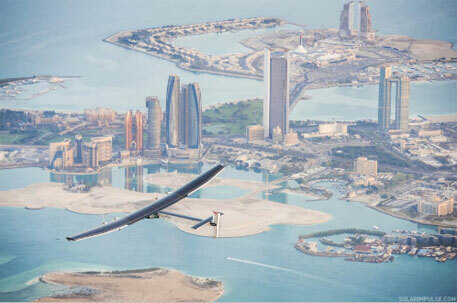 Solar Impulse-2 or Si-2, an airplane which uses only solar power and which does not require a single drop of fuel, will take off from Abu Dhabi on March 7 and fly around the world in a first-of-its-kind journey. Produced by the Swiss-funded venture, Solar Impulse, the plane will be flown by Bertrand Piccard and André Borschberg who will take turns flying during their five-month flight. The plane will cover 35,000 km and make stops in Muscat in Oman, Ahmedabad and Varanasi in India, Mandalay in Myanmar and Chongqing and Nanjing in China, among other cities. The aircraft is expected to return to Abu Dhabi by late July or early August 2015. The team’s aim is to demonstrate the importance of innovating with renewable energy and highlighting new solutions for environmental problems. Si-2 also opens up the possibility of commercial solar flights in the future. Are we moving towards a renewable energy economy?